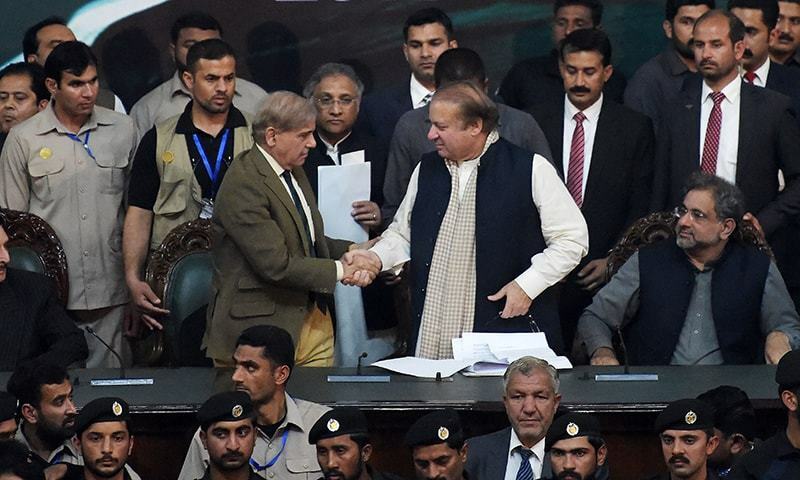 Punjab Chief Minister Shahbaz Sharif was elected the PML-N president unopposed at a convention of the party's General Council on Tuesday. Addressing the council's meeting in Islamabad after his election, Shahbaz said he was honoured to have been chosen as the party president but that no one, including himself, could even think about taking the place of Nawaz Sharif, who was removed as party president by the Supreme Court but was later rechristened as the party's 'leader for life'. "I believe Nawaz Sharif is the only Pakistani politician and leader that can be called Jinnah's political heir," he told a roaring crowd chanting party slogans. "We are lucky to have been blessed with a Quaid [leader] like Nawaz Sharif." Nawaz made Pakistan's defence "invincible" through atomic weapons, rejected $5 billion aid from the US and built motorways, he said. History will also remember Nawaz for eliminating terrorism through the sacrifices of armed forces and nearly eliminating load shedding, he added. Shahbaz said he got the chance to serve the people because of his elder brother. "My political upbringing by Nawaz Sharif is an asset of my life. I assure you that with the guidance of the quaid [leader] I will do my best to serve the people and the party." But the PML-N president cautioned that today was not a day to give and receive congratulations. "The world knows that our leader has been persecuted and discriminated against," he said. "[But] my heart tells me that Nawaz Sharif will get justice [one day]." In his address to the convention, Nawaz said he is unable to understand why a prime minister that was elected by the votes of tens of millions of Pakistanis was abruptly removed. It is not easy to end an era of load-shedding, he said, adding that his government had managed to achieve the seemingly impossible feat. Nawaz forbade them audience from chanting slogans, saying today's was a solemn occasion because the country faces an uncertain situation. "We worked hard and resolved to erase the darkness from this land," he said, adding that the people who were experiencing 20-22 hours of load-shedding daily a few years ago are now living their days in peace. Nawaz said multiple motorways and road projects started by him have been completed or are nearing completion. He said Prime Minister Abbasi will have to inaugurate those projects because he personally does not feel like going anywhere anymore. "I am a human too," he said, adding that his heart has been broken by the mistreatment allegedly meted out to him. The PML-N 'leader for life' said the next 70 years for Pakistan should not be like the past 70 years, and sought the people's support to work for the country's betterment. Nawaz said the manifesto of his party is based on four words: "Vote ko izzat do [respect the people's vote]." Asking the public to turn the upcoming general elections into a "referendum", Nawaz said he's facing NAB cases not because any corruption has been proven against him but because he "talks about the respect for people's vote". Talking about the loss of PML-N backed candidates in the election for Senate chairman and deputy chairman, he said those talking about a new Pakistan had proven themselves to be "key-operated toys" after yesterday's "drama" in the upper house. In a reference to Pakistan Tehreek-i-Insaf Chairman Imran Khan and PPP co-chairman Asif Ali Zardari, he said, "The one from Banigala, those from Bilawal House and the caravans from KPK... all went and bowed in the same spot." Addressing them, he asked who they had "prostrated before" and what services that person had given to the country. "You have lost even though you won and we have won despite having lost," Nawaz said. "We are not the ones to compromise... we are not the ones to sell Pakistan for our own benefit." The post of party president was left vacant last month after Nawaz was removed from the position by the apex court. Shahbaz, who was serving as the party's interim president, had submitted his nomination papers for the presidency today. He was the only nominee for the position of party head, but his victory was formally announced at the party's General Council meeting in Islamabad, during which voting for the party's president also took place, according to Law Minister and PML-N's Chief Election Commissioner Mahmood Bashir Virk. Many of PML-N senior leaders, including Shahbaz, Nawaz and Prime Minister Shahid Khaqan Abbasi were present at the GC meeting. The PML-N has been facing a leadership crisis since the apex court, in its July 28 Panama Papers judgement, ordered Nawaz's disqualification from public office and he was removed as party head. However, with the speedy passage of the Elections Act 2017 ─ which amended the requirements necessary for top party leadership to possess ─ Nawaz managed to retake party leadership. But he was removed again from the post after the court ruled in February this year that a disqualified person is ineligible to lead a party. Mismanagement was observed at the polling venue earlier as party workers attempting to enter were prevented from doing so by security personnel at the Convention Centre. Workers then resorted to violence, breaking glass doors at the venue, causing some workers and leaders to receive injuries. Brother of disqualified Nawaz Sharif is to be become next president of PNL-N - this is amazing, as dynasty is likely to continue for a while! But not for long, as corruption cases are pending against Shabaz Sharif as well, and he is likely to be 'disqualified' for his corrupt practices and involvement in Model Town's incident and bribery cases. In my view, it is end of NS's dynasty! Nice to be unopposed, of course this is democracy PMLN style. Such a popular leader no one opposes him. Just like the elder but corrupt brother. For sure, history is repeating itself. It seems, Nawaz Sharif's dynasty is in danger and likely to be doomed in near future for ever! All efforts to save mafia have failed, as integrity, justice, loyality and petriotitism have won, and become top priority for Pakistan. NS the courrput Heir to Quaid Aazam! Is this a joke SS. However, in essence, you have replaced him contrary to what you think. This implies that your thinking was wrong and misleading, to say the least. What a halarious coment by CM Punjab "Nawaz Sharif can be considered the political heir of Quaid-i-Azam,"
SS will be the First to replace Nawaz S from Politics . Whatever else you may say, please keep the founder of the nation out of it. No comparisons with him. Period. PMLN have no shame.I would feel shame in comparing MNS with Quaid I Azam MAJ. Looking at the two one was one of the youngest Barristers cf Nawaz with a third division degree. MAJ gave everything he had to Pakistan MNS stole everything he could. MAJ had dignity and MNS has no shame. I could carry on but what is the point. The end of Shariff family will be more horrible then Ghadaffi and Saddam. Very dangerous days are coming. Please stop comparing Nawaz Shareef to Quide Adam.Jinnah gave his wealth for this country and both of you have robbed the nation and sold out to some Middle Eastern nations. My blood boils on this idiotic comparison. Please wash your mouths with Dettol before taking Jinnah' name . 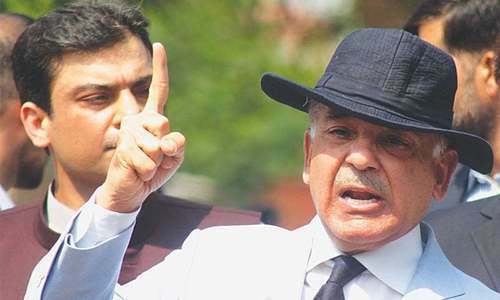 "Tum Log Jinnah Kay Jooton Kay Brabar Nahin Ho"
Shahbaz said today is "not a day to celebrate" because the world knows that his party's leader has been "targeted". should have chosen words correctly. Party leader have been caught in corruption and looting money. Our Prayers are with you. Ignore the Haters keep working. The only person qualified to replace Shariff has to be another Shariff. After Shabaz there are others in line, Maryam, Hamza and their progeny! Big words to distract the ignorant and poor followers. The world knows that justice is done with NS. Not in millions but in billions Shrief family has stolen Pakistan’s money. @Nahid Hussain Chohan, well said!! 'political heir of Quaid-i-Azam'. No. Absolutely not. Do these people even understand what they are weaving, saying and comparing in desperatioin? They are acting and uttering more ridiculous every passing moment and remark. The fact remains that w/o believing in truth, telling truth and coming out clean with truth, there is no hope for them. @Shoaib Rehman Brother Please come to Sindh, South Punjab, Hospitals in Lahore see the world for yourself three patients on one bed, people drinking waters from animal ponds hopefully that is enough for you to understand brother. These looter have destroyed every aspect of social fabric of Pakistan. The only way to Progressive, Industrialized Pakistan is with Nawaz/Dar/Zardari mafia who are billions. Sad, sad state of affairs of Pakistan, but with just social activism for our people these mega looters are seeing their last days. Shahbaz Sharif, enjoy but dont think of becoming Nawaz Sharif or you may also lose your position. In educated societies people would never vote for people there was even doubt about their character, In Pakistan case it is obvious these politicians are highly corrupt and looted the country. Pakistan is not a democracy, in a true democracy the same family does not have power and the power does not pass on to the families, borthers, sisters, children wives that is normally called a monarchy or dictatorship. Pakistan will be true democracy when people from grass route of the party will be able to become prime minster of pakistan who are not from these 2 families which rule pakistan. Mercy on this nation when Nawaz Sharif is called by his brother political heir of the Father of the Nation. Shame on these brothers. Obviously they have no shame. Say whatever you want to please your brother but please spare Quaid Azaam. 'Cannot even think of replacing Nawaz', but you just did man. Jinnah's political heir?. These guys have lost their mind. What Pakistan's main political parties are doing is creating diversions and not focusing on real issues. Faces come and go, who cares. Its the system that will continue to serve people and that is good governance, democracy, vision and self respect. All of these are missing. Unfortunately, a large portion of our nation do not really understand this. The systems needs to be overhauled/changed. Powerful mafia will never let the power and money go and they will go to the end to protect themselves. To compare the current lot with Jinnah is a disservice to him. Jinnah was impeccable in financial matters. quite frankly to compare a tax dodging self serving man like nawaz to Jinnah is an insult to Mr Jinnah. Mr Jjinnah did not fill his pockets at every opportunity like nawaz. Nor did he seek to create a family based party to serve himself with his name slapped on it. Nawaz is not even 0.0001% the man Mr Jinnah was. And what was Nawaz's contribution to the nuclear program? It was built long before he was ever elected as PM. If any poltician should get credit for it, it was Zulfiqar Bhutto love him or hate him who initiated the programme. Mian Shahabaz Sharif has served the nation with zeal and nothing can raise doubts about his services. He has experience spanning over decades and his appointment as successor to the Mian Nawaza Sharif cannot be termed as dynastic politics. He has spent his life in politics and service of people and his appointment would further strengthen the agenda of development in the country. Pakistan is facing the worst form of Monarchy. Same corruption different face but not for long, hopefully the SC can make these cases stick against this evil family. "I believe Nawaz Sharif is the only Pakistani politician and leader that can be called Jinnah's political heir,"
Please do not disgrace Quaide Azam by this comparison. Quaide Azam was an intelligent, visionary, and honest leader while Nawaz is none of these. These shameless brothers have the cheek to think they can be compared to Quaid-e-Azam!!!!! Please have some shame and not compare him to a successor of Quaid e Azam. Shahbaz insulted Quaide Azam mr. Jinnah to compare his brother to him. @Shoaib Rehman : I support you. There are many supporters of NS and SS as well. good workmanship will always win & prevail. Democracy in this land is merely a farce to show to the world that we also follow the rules for public representation in our country. The manner in which elections are taking place, both for the senate and for the assemblies just goes to show the high class drama that is played in the name of democracy. Nwaz Sharif heir to Quaid-e-Azam? There can be no bigger insult to Mr.jinnah.Shabaz has to apologize and take his words back.The nation demands it. Didn't see Maryam, a rising star in N League?? Your brother sure will leave other legacies including introduction of Lies and Corruption in Pakistani politics. The claim by Shahbaz Sharif that Nawaz Sharif made Pakistan an atomic power is factually incorrect. The project was conceived and started by Bhutto years before Nawaz Sharif became PM of Pakistan. Even the party should be renamed as PML(S)! So, it looks like PML-N is owned by Sharif family. It DOES NOT belong to the people of Pakistan. Brother elected without opposition. New slogan, ‘ kew banaya’. I agree with him no body can replace NS who can accumulate billions in such a short time . The decline of PML(N) has started. There was not one word of truth in that speech, I did this and I accomplished that. Well Nawaz Sharif, load shedding has not ended, people still sit in darkness, still hardly have any gas, still no clean drinking water, corruption still exists. Yes there are many motorways, but those motorways do not help the majority of people who do not have a car. I'll tell you why you have cases against you in the accountability courts, it wasn't because you respect the people's vote, its because you were proven dishonest in the court of law, the Supreme court. Now you face corruption charges. Good Luck. I consider it disrespectful towards the Great Quaid-A-Azam to have Shahbaz Sharif call Nawaz the political heir of the Quaid. How dare he even consider comparing a dishonest politician to our founder. @Mittha Khan, The load shedding has not been eliminated, where have you been? And what infrastructure are you referring to? You mean the motorways? Yes I see how that helps the majority of the people of Pakistan.His vision is going to be limited seeing thru the bars. "Cannot even think of replacing Nawaz". What a cheesy statement. But perfectly suits those who follow blindly. It seems amazing to me how anyone can become a cult like follower of a personality. In my book if one cannot even think of an idea, good or bad, then one might well be a robot. He's already been disqualified, what else is left. Shahbaz Shareef's rhetoric will not bring Nawaz Shareef back to power. Only time will show how many more are going to be disqualified.